A UCL scientist and his team designed and built the synthetic windpipe 'scaffold' used in an operation in Sweden announced by the Karolinska University Hospital and Karolinska Institutet today. The windpipe (trachea) implanted in this patient was developed using nanocomposite materials which were developed and patented by Professor Alexander Seifalian (UCL Division of Surgery & Interventional Science), whose labs are based at the Royal Free Hospital. Together with Professor Paolo Macchiarini at Karolinska, who also holds an Honorary appointment at UCL, Professor Seifalian designed and developed the trachea scaffold using a material known as a novel nanocomposite polymer. Professor Seifalian has worked closely with UCL Business (UCLB), responsible for technology development and commercial transactions at UCL, to patent these materials and develop their use in medical devices. As well as being used for tissue scaffolds, the materials have other potential uses such as coronary stents and grafts. A nanocomposite is a material containing some components that are less than 100 nanometres (nm) in size. To give a sense of scale, a human hair is about 60,000 nanometres in thickness. A polymer is a repeating chain of small, identical molecules (called monomers) which are linked together. Polymers are already used in medical devices, but the properties of these novel polymers reduce the risk of rejection, rupture, or the need for repeat surgery. They have better elasticity, strength and versatility and are formulated to encourage cell growth. A full size 'y-shaped' trachea scaffold was manufactured in Professor Seifalian's labs. This was accomplished using a CT (computerised tomography) scan of the patient as a guide, to create the exact shape and dimension needed. A mould was then made using glass. When the polymer scaffold had been made, it was taken to Karolinska where the patient's stem cells were incorporated to it (or 'seeded') by Professor Paolo Macchiarini's team, and the full biological trachea was grown in a bioreactor - a device designed for the procedure by Harvard Bioscience which provides the correct environment for the tissue to grow. This process means the trachea very effectively simulates natural tissue and has the same properties as a 'real' trachea. Professor Seifalian said: "Professor Macchiarini has previously performed successful transplants of tissue engineered tracheas, but on those occasions the tracheas used were taken from organ donors and then reseeded with the patient's own stem cells. "What makes this procedure different is it's the first time that a wholly tissue engineered synthetic windpipe has been made and successfully transplanted, making it an important milestone for regenerative medicine. We expect there to be many more exciting applications for the novel polymers we have developed." 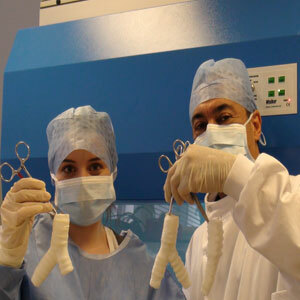 Images: (Top) Claire Crowley and Professor Seifalian with the synthetic windpipe. (Bottom) The windpipe after the stem cells have been incorporated, just before transplantation. UCLB is responsible for commercialising innovations arising from the research base at UCL, one of the UK's leading research-led universities. UCLB undertakes a broad range of knowledge transfer activities, covering the facilitation of consultancy and collaborative research engagements through to technology transfer, company incubation and investment.